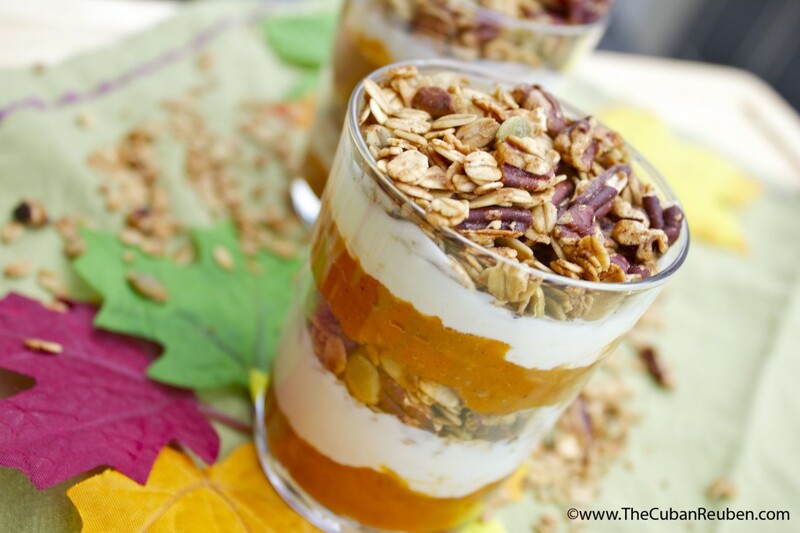 Pumpkin Parfait with Salted Maple Granola: Big news! Avid readers of The Cuban Reuben may have noticed that it’s been a bit since I’ve last posted. Since embarking on this blogging journey nearly two (yikes!) years ago, I’ve prided myself in maintaining a pretty regular posting schedule. This level of commitment has certainly presented challenges along the way, whether they be from a harried work schedule or a lack of inspiration, but no challenge has been greater than the one that presented itself a few short months ago. And since this is a space where I share my thoughts freely, I thought it was only fair that I reveal what’s been keeping me away so long. I’ve got big news! 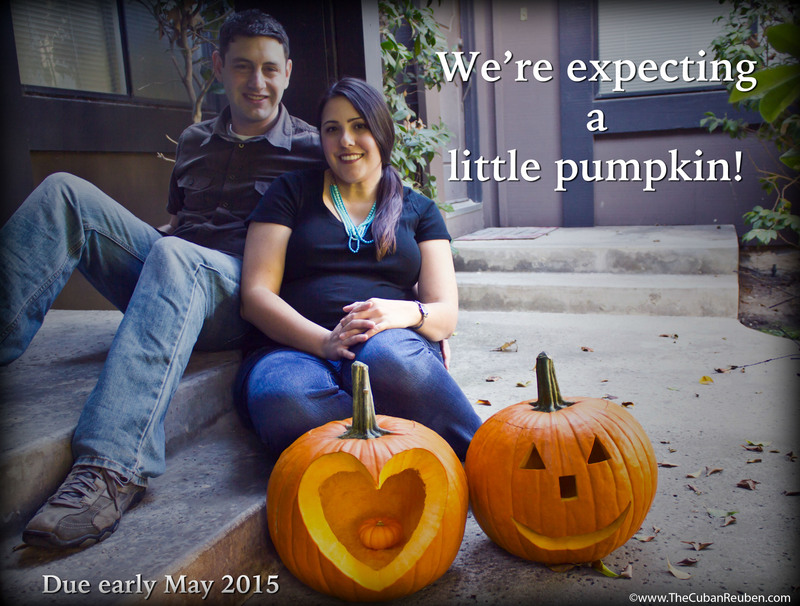 The official announcement we shared with our family and friends. Yes, yours truly will be joining the ranks of matriarchs come May, and I could not be happier. Of course, that’s because I’ve finally emerged from the cloud of morning sickness that was plaguing me for quite some time. Forgive me, dear readers, for not wanting to step foot in my kitchen. Whomever labeled it “morning sickness” was totally off. “All-day sickness” is more accurate. While I still suffer through some serious aversions to food I normally love (read: Kale), I’m happy to report that the worst of it is behind me, and I am feeling pretty great. This means that I have slowly but surely ventured back in the kitchen in an effort to provide nourishment for my little pumpkin beyond the string cheese and saltines that carried me through my first trimester. The pepitas are my favorite part of this granola. My re-entry to the kitchen has been gradual at best, and my first attempt at something nutritious yielded great validation that “pregnancy brain” is a real thing. While creating a delightfully seasonal granola flavor, I unintentionally added double the amount of salt I normally use. Of course, I didn’t realize my blunder until after I finished baking a giant batch. Not one to easily be defeated in the kitchen, I opted to rescue my recipe by not only pairing it with a sweet treat, but using the leftovers as a crunchy protein-rich topping for salads. Start your day off right with this healthy alternative that hits all the right cravings. In a small saucepan over low flame, heat the coconut oil, maple syrup, vanilla extract, salt, and pumpkin pie spice, stirring constantly until salt and maple syrup have dissolved. Set aside. In a very large bowl, combine the oats and nuts. Drizzle the oil/syrup mixture over the oats and nuts, and stir until completely coated. Remove sheets from the oven, and cool. Store in an airtight container. In a bowl, combine pumpkin, syrup, and pumpkin pie spice. Stir to combine. 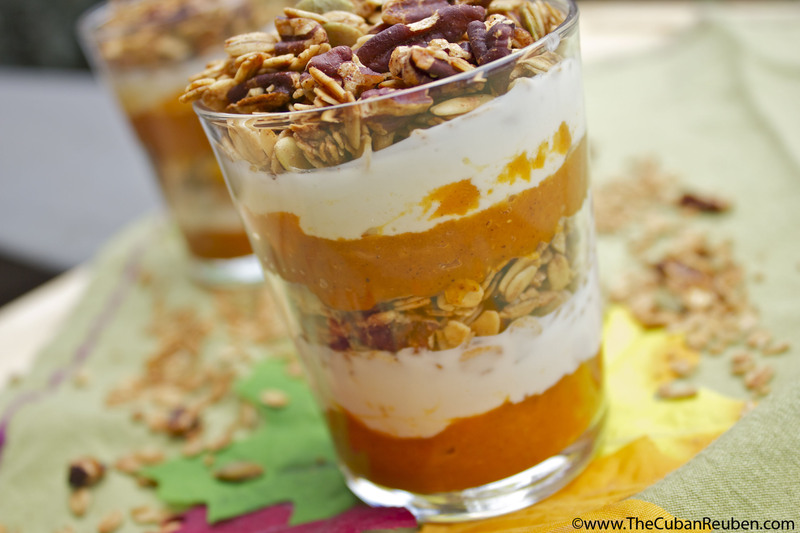 In a small glass, bowl, or other serving dish, layer pumpkin, yogurt, and granola. Serve immediately, or chill in the refrigerator for later. *The granola recipe makes quite a bit of granola. It also tastes great on a nice scoop of ice cream, or even as a crunchy salad topper. *If salted granola is not your thing, feel free to reduce the amount of salt by half. *For a sweeter, more indulgent treat, substitute whipped cream for the yogurt. Jenny!! Whoot Whoot! A little pumkin?! A BABY!!! So HAPPY FOR YOU!!! Dear Jenny, I’m so happy to read this wonderful news, congratulations to you and your husband, hugs!!! Take care and enjoy it.